I have made some stuff for the Erlenhof kitchen. The stove is made from styrofoam and balsa. The base is painted with regular acrylic paint and the top is painted with Eberhard Faber Granite Paint. You can get a very nice rough-surfaced stone texture with Granite Paint. (Unfortunately it is so dark here now that it is impossible to take a sharp picture of this room). Olen tehnyt vähän tavaraa Erlenhofin keittiöön. Liesi on tehty styroksista ja balsasta. Alaosa on maalattu tavallisella akryylimaalilla ja yläosa Eberhard Faber Granite -kivimaalilla. Kivimaalilla saa todella kivan rosoisen kivipinnan. (Valitettavasti nyt on niin vähän valoa, että on mahdotonta saada otettua tästä huoneesta tarkkaa kuvaa). 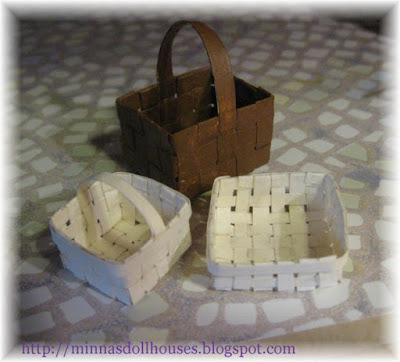 I made these baskets from thick paper and one of them I painted. Tein nämä korit paksusta paperista ja yhden niistä maalasin. I loved your blog it´s just amazing! Thanks for the printables ideas. Kisses! Hi, thank you for visiting my faerietale blog. 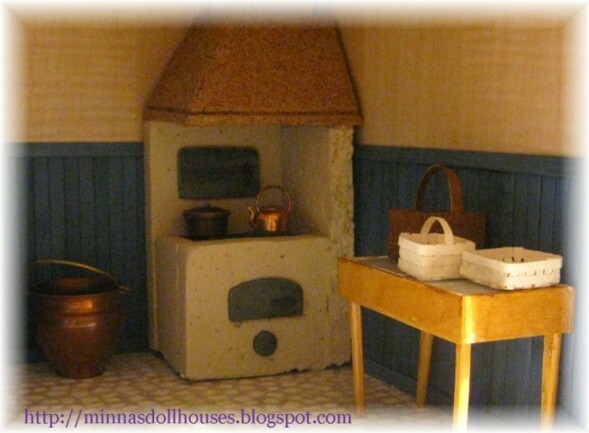 I love all the tiny things you shoe here, one day i vow to have a dolls house again. My daughters & i spent hours when they were small, making mini things. Thanks for sharing your baskets! I'm going to try to make one. I like the brown one best. Looks so real! AS CESTAS FICARAM PERFEITAS!E O FOGÃO TAMBÉM FICOU MUITO LINDO,COMO TODAS AS MINIATURAS QUE VOCÊ FAZ.BEIJOS DO BRASIL. It's always nice your blog, full of usefull things and beautiful minis. the stove is awesome!!! Love the baskets too- hope you are having a wonderful week! you, because I think your blog is lovely. Your work is really great. Miniatures is my favorite hobby. "The stove is fantastic an so are your crocheting." Like you I collect and also make things for dollhouses and dolls. You can find a lot on my homepage.